Last week, some of the I-AM team were excited to attend the opening of the brand new VQ restaurant on Great Russell Street. I-AM have worked with VQ for a number of years and this latest collaboration marks a new and exciting phase of the VQ journey. The Great Russell Street site is much larger than the restaurant in Fulham where VQ have made their name, but still needed to encapsulate the core VQ idea of ‘24-hour life’. The I-AM designers focused on the idea of how light and shadows change in a space throughout the course of a day, and looked at the ways in which light moves across different materials. The key features of the space include a striking 8 metre light wall that stretches across an entire wall, displaying low-resolution images of ‘London life’. The content is designed to capture the movement of city life whilst the mood ranges calming and light, to slightly more darker and vibrant in the evening creating an entirely different atmosphere in the restaurant. ‘Time’ is featured on another wall mural that depicts digital projections of clocks been drawn on the the patterned wall. The introduction of timber and leather has warmed the palate from the previous VQ site in Fulham; famous quotes adorn the walls, all featuring anecdotes about time and ‘24-hour life’ and the monochromatic colour schemes, clean lines and angles mean the space is a beautiful space to sit and let time go by. The launch party was an enormous success with the restaurant full of VQ-lovers, if you haven’t check out this great London institution then make sure you get down there. 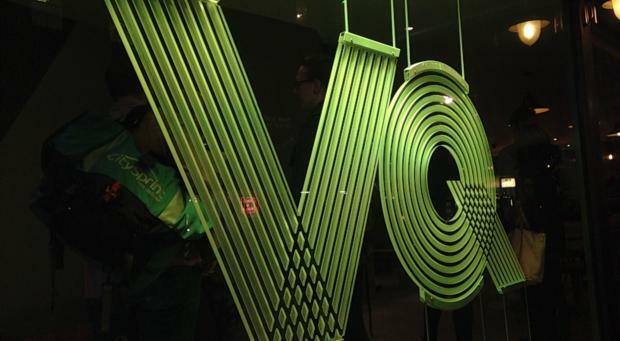 VQ are offering a 50% food discount until the end of October for their soft launch. A: 111a Great Russell Street, London WC1B 3NQ.